Nominal door width + 1 1/4"
Rough Opening height must provide clearance to level the header and interlock the jambs. Uneven floors will affect this measurement. 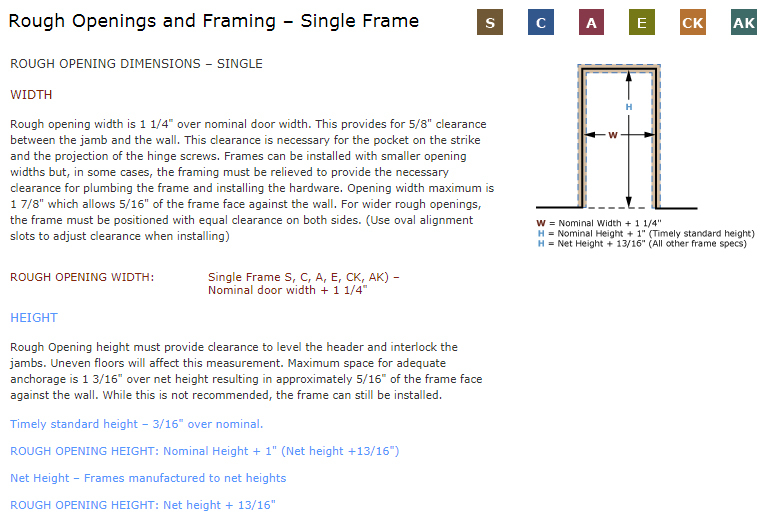 Maximum space for adequate anchorage is 1 3/16" over net height resulting in approximately 5/16" of the frame face against the wall. While this is not recommended, the frame can still be installed. Timely standard height – 3/16" over nominal. 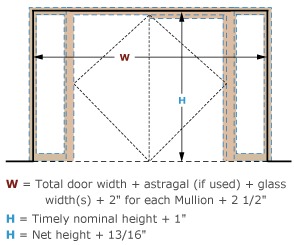 ROUGH OPENING HEIGHT: Net height + 13/16"
For a pair of doors, the rough opening width is 1 1/4" larger than the total nominal width of the doors plus the width of any astragal mounted between the doors. 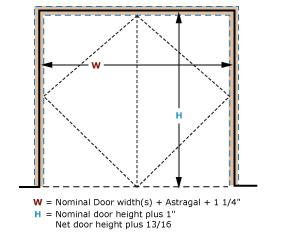 ROUGH OPENING: Nominal Door width(s) + astragal width (if mounted between the doors) + 1 1/4"
For a pair of doors, the rough opening height is 1" over nominal height or 13/16" over net height. 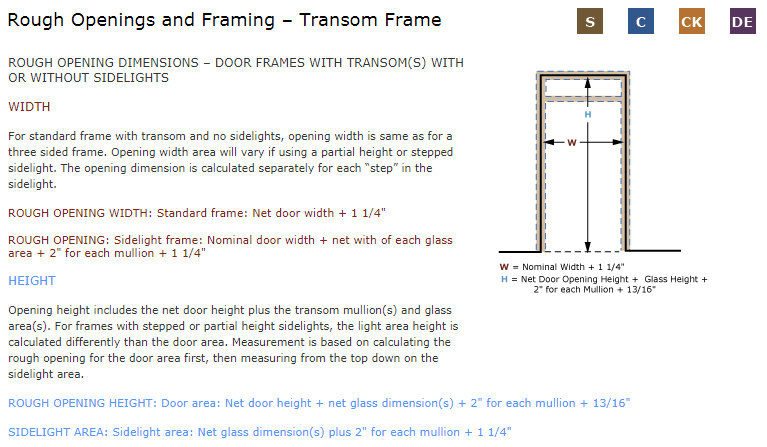 Since Timely standard frames are actually 3/16" longer than the nominal height (Timely 7'0" frames are actually 7'0 3/16" long). 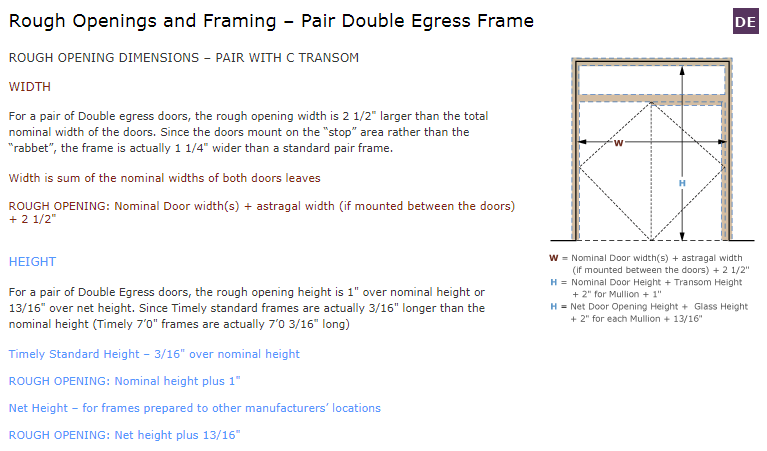 ROUGH OPENING: Door height + 1 1/4"
For a pair of Double egress doors, the rough opening width is 2 1/2" larger than the total nominal width of the doors. 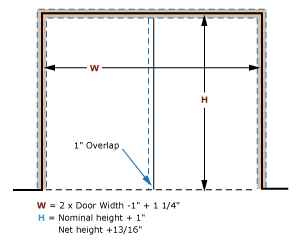 Since the doors mount on the “stop” area rather than the “rabbet”, the frame is actually 1 1/4" wider than a standard pair frame. 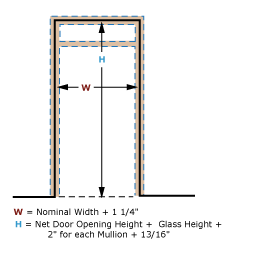 ROUGH OPENING: Nominal Door width(s) + astragal width (if mounted between the doors) + 2 1/2"
ROUGH OPENING: Nominal height plus 1"
ROUGH OPENING: Net height plus 13/16"
For Single access doors, the rough opening width is 1 1/4" larger than the nominal door width. 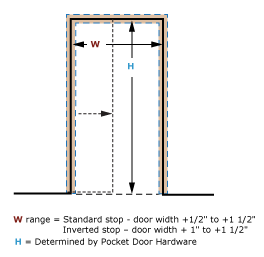 ROUGH OPENING: Nominal Door width + 1 1/4"
For Single access door, the rough opening height is 1 1/4" larger than the nominal door height. 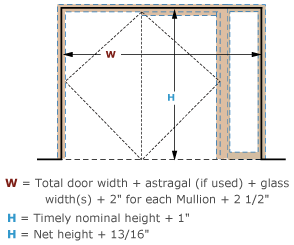 For a Pair access door frame, the rough opening width is 1 1/4" larger than the total of the nominal door widths. 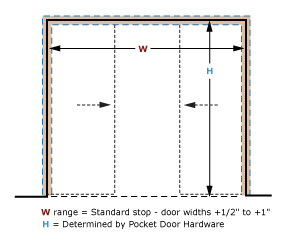 ROUGH OPENING: Nominal Door widths + 1 1/4"
For Pair access door, the rough opening height is 1 1/4″ larger than the nominal door height. 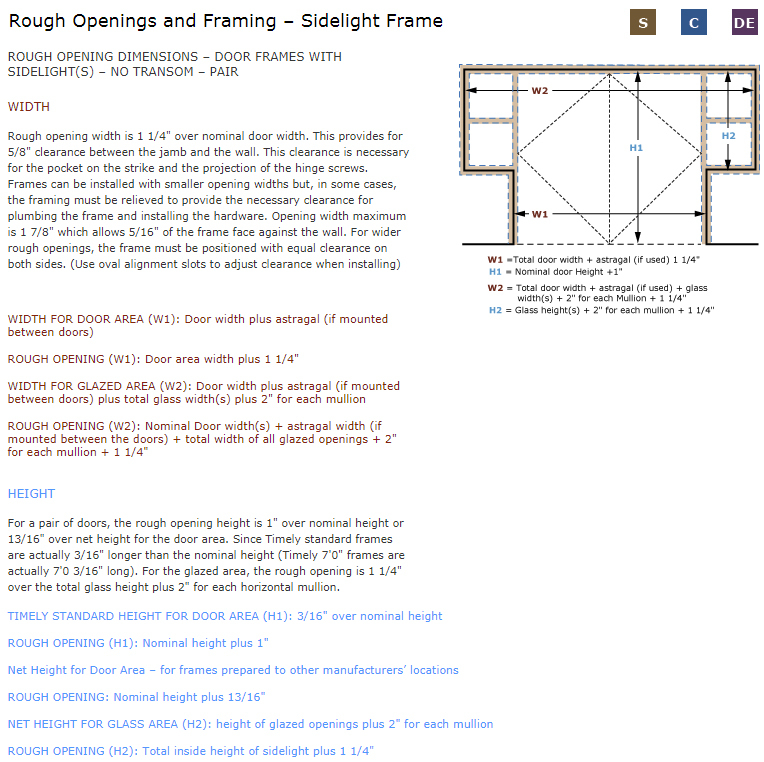 For Borrowed lights, the rough opening width is 1 1/4" larger than the inside glass area, including any mullions. For stepped borrowed lights, the dimension is calculated separately for each step width. ROUGH OPENING: Glass width + 2" for each mullion + 1 1/4"
For Borrowed lights, the rough opening height is 1 1/4" larger than the inside glass area, including any mullions. For stepped borrowed lights, the dimension is calculated separately for each step width. ROUGH OPENING:Glass height + 2" for each mullion + 1 1/4"
Opening width area will vary if using a partial height or stepped sidelight. The opening dimension is calculated separately for each “step” in the sidelight. 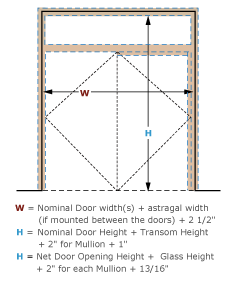 ROUGH OPENING WIDTH: Nominal door width + width of glass area(s) + 2" for each mullion + 1 1/4"
Opening height equals the net door height. 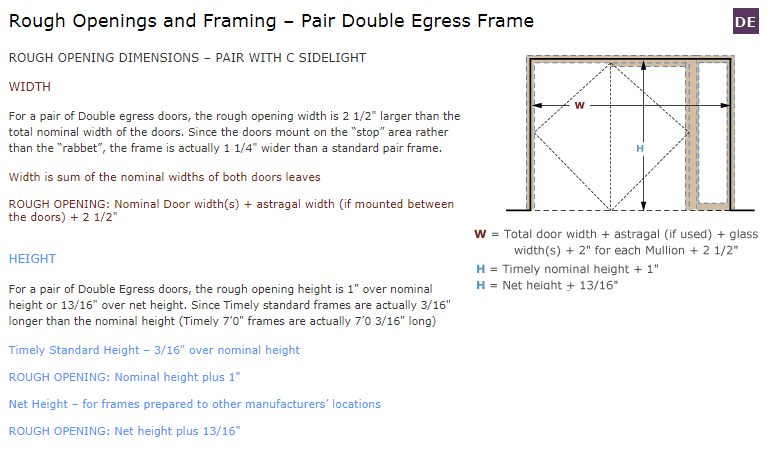 For frames with stepped or partial height sidelights, the light area height is calculated differently than the door area. 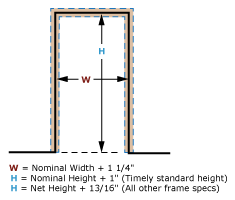 Measurement is based on calculating the rough opening for the door area first, then measuring from the top down on the sidelight area. ROUGH OPENING HEIGHT: Door area: Net door height + net glass dimension(s) + 2" each mullion + 13/16"
SIDELIGHT AREA: Net glass dimension(s) plus 2" for each mullion + 1 1/4"
ROUGH OPENING (W1): Door area width plus 1 1/4"
ROUGH OPENING (W2): Nominal Door width(s) + astragal width (if mounted between the doors) + total width of all glazed openings + 2" for each mullion + 1 1/4"
For a pair of doors, the rough opening height is 1" over nominal height or 13/16" over net height for the door area. 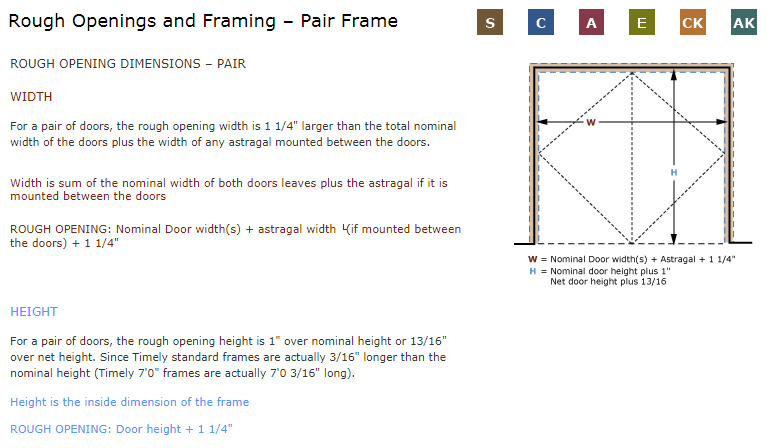 Since Timely standard frames are actually 3/16" longer than the nominal height (Timely 7'0" frames are actually 7'0 3/16" long). For the glazed area, the rough opening is 1 1/4" over the total glass height plus 2" for each horizontal mullion. ROUGH OPENING (H1): Nominal height plus 1"
ROUGH OPENING: Nominal height plus 13/16"
ROUGH OPENING (H2): Total inside height of sidelight plus 1 1/4"
For standard frame with transom and no sidelights, opening width is same as for a three sided frame. Opening width area will vary if using a partial height or stepped sidelight. The opening dimension is calculated separately for each “step” in the sidelight. ROUGH OPENING WIDTH: Standard frame: Net door width + 1 1/4"
ROUGH OPENING: Sidelight frame: Nominal door width + net with of each glass area + 2" for each mullion + 1 1/4"
Opening height includes the net door height plus the transom mullion(s) and glass area(s). 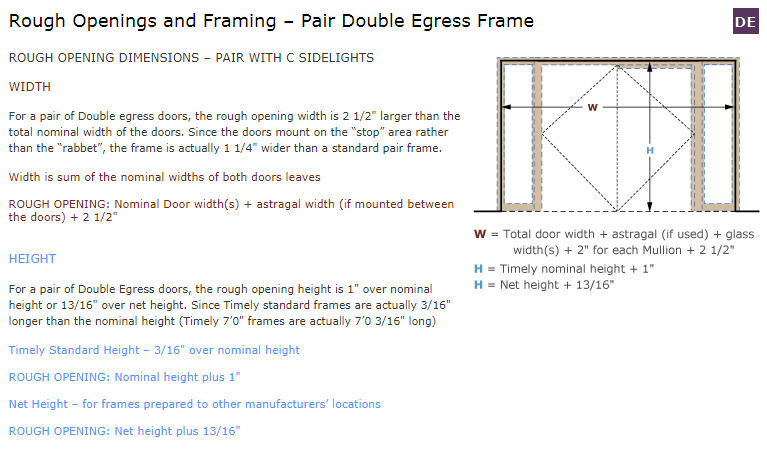 For frames with stepped or partial height sidelights, the light area height is calculated differently than the door area. 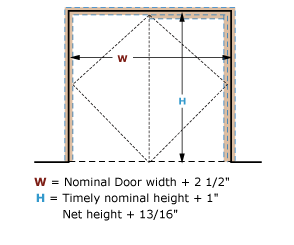 Measurement is based on calculating the rough opening for the door area first, then measuring from the top down on the sidelight area. ROUGH OPENING HEIGHT: Door area: Net door height + net glass dimension(s) + 2" for each mullion + 13/16"
SIDELIGHT AREA: Sidelight area: Net glass dimension(s) plus 2" for each mullion + 1 1/4"
The rough opening for pocket doors is actually created by the pocket frame system used. The Timely P series trim kit is designed to fit most common applications. In some cases, wood pocket frames are used that include a 3/4" strike jamb piece the full width of the wall. Since the Timely pocket trim kit is designed to replace this component, there will be a conflict when using this type of frame. Instead of recommending a rough opening size, we give guidelines that will accommodate standard sizes of trim kits. 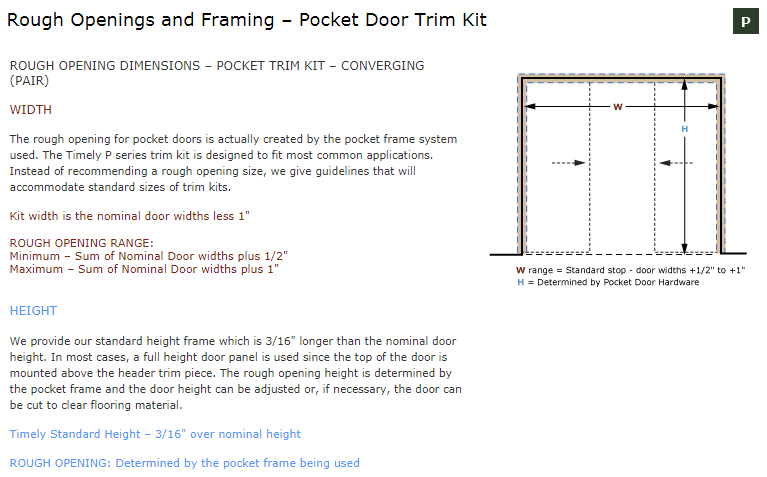 Kit width is the nominal door width less 1/2" for standard stop and 1" less for inverted stop. 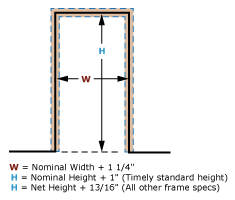 Minimum – Nominal Door width plus 1/2"
Maximum – Nominal Door width plus 1 1/2"
Minimum – Nominal Door width plus 1"
We provide our standard height frame which is 3/16" longer than the nominal door height. 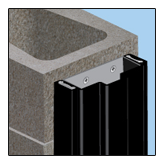 In most cases, a full height door panel is used since the top of the door is mounted above the header trim piece. The rough opening height is determined by the pocket frame and the door height can be adjusted or, if necessary, the door can be cut to clear flooring material. The rough opening for pocket doors is actually created by the pocket frame system used. The Timely P series trim kit is designed to fit most common applications. 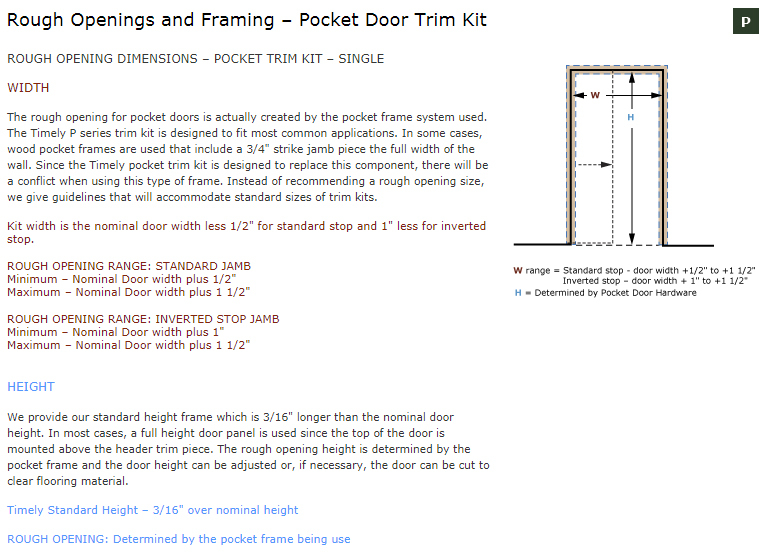 Instead of recommending a rough opening size, we give guidelines that will accommodate standard sizes of trim kits. 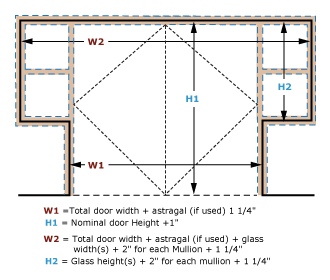 Kit width is the nominal door widths less 1"
Minimum – Sum of Nominal Door widths plus 1/2"
Maximum – Sum of Nominal Door widths plus 1"
For Bi-Fold doors, the rough opening width is 1 1/4" larger than the total nominal width of the doors. 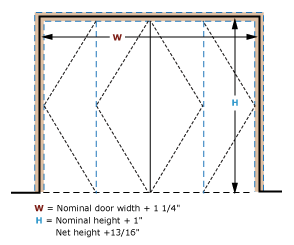 If using a pair of 2'0" bi-fold doors, each door is 1'0" nominal width. 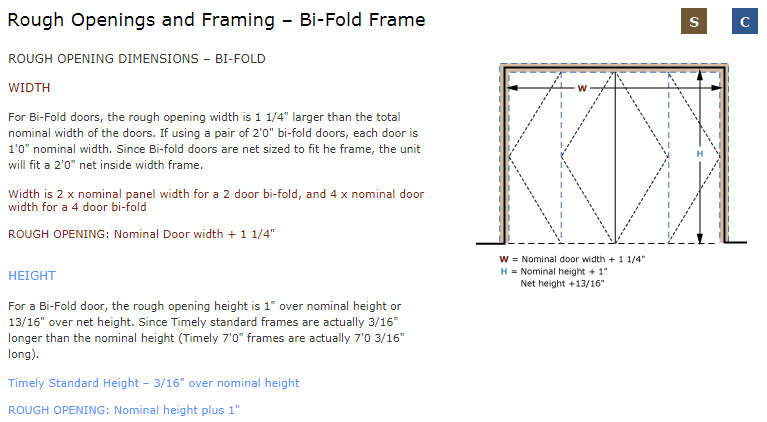 Since Bi-fold doors are net sized to fit he frame, the unit will fit a 2'0" net inside width frame. For a Bi-Fold door, the rough opening height is 1" over nominal height or 13/16" over net height. 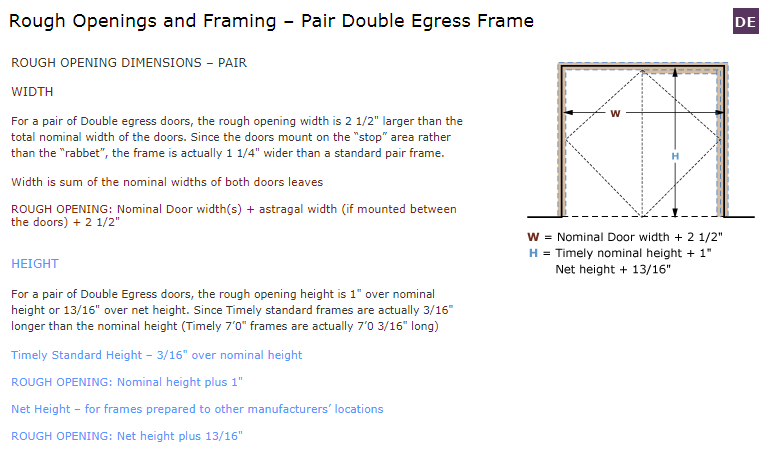 Since Timely standard frames are actually 3/16" longer than the nominal height (Timely 7'0" frames are actually 7'0 3/16" long). 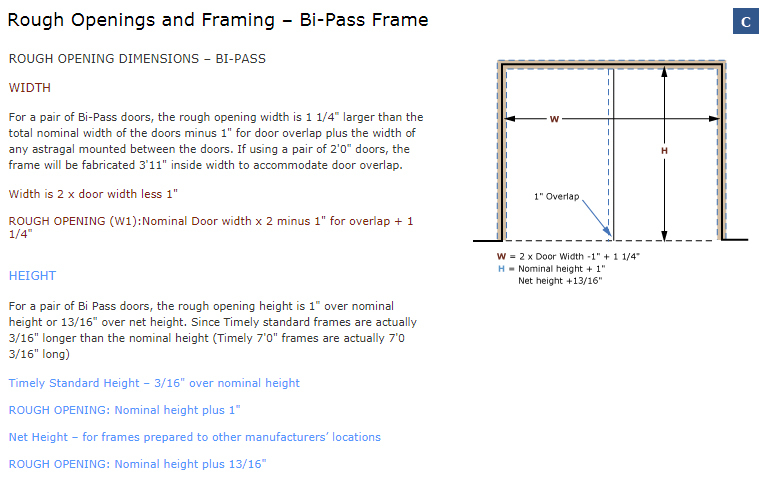 For a pair of Bi-Pass doors, the rough opening width is 1 1/4" larger than the total nominal width of the doors minus 1" for door overlap plus the width of any astragal mounted between the doors. If using a pair of 2'0" doors, the frame will be fabricated 3'11" inside width to accommodate door overlap. 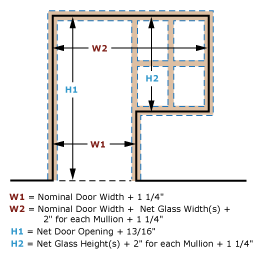 Width is 2 x door width less 1"
ROUGH OPENING (W1):Nominal Door width x 2 minus 1" for overlap + 1 1/4"
Vertical Sub Frame (Cased opening no stop) Existing Opening Height minus 1/16"
Horizontal Sub Frame (Cased opening no stop) Existing Opening Width minus 3 3/16"
Vertical Finished frame dimension Existing Opening Height minus 2"
Horizontal Finished frame (header) Existing Opening Width minus 4"
Vertical Sub Frame – wood, ripped to standard frame width Existing Opening Height minus 1/16"
Horizontal Sub Frame – wood, ripped to standard frame width Existing Opening Width minus 3 1/16"
Some projects require the entry door frame or closet door frame to be installed between two parallel walls. When this situation occurs, there are two factors to be considered. The first issue is having enough space to install the desired door width. This is important if the opening must comply with ADA requirements for adequate path of travel width. The finished wall to wall dimension must be at least 4" larger than the nominal door width if using TA-8, TA-23, TA-28 or TA-28M casing. If using TA-30 or TA-35 casing width is 4 1/2" wider. The second issue is adequate blocking for the framing material at the door location. The wall must have solid blocking to attach the stub wall prior to installing the frame. 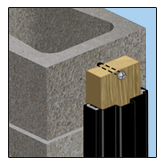 Whether using wood studs or steel studs, proper fasteners must be used to achieve adequate support for the door frame.